What is alt text, and why do you need to use it? Alt text is short for ‘alternative text’. Its purpose is to provide the information about an image, especially when the images in your emails are not able to be read by your subscribers. A subscriber may have blocked images in emails, for example, for security purposes. Alternately, an email service may turn off images by default. Either way, unless you’ve included alt text in your images, your email might look pretty bare. 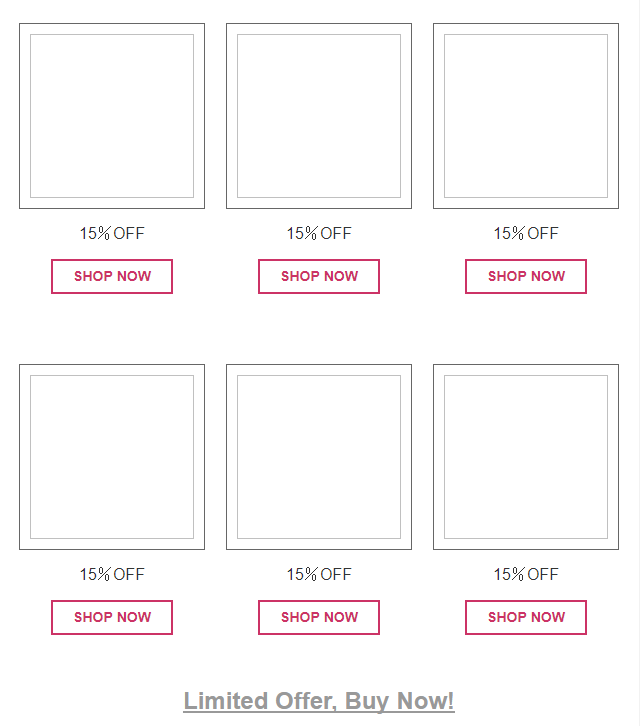 With images blocked, this email has no information about the featured products. All that time designing a beautiful email newsletter for nothing. If people can’t see what you’re marketing, they’re probably not going to buy it. By using alt text, you can also still communicate information about your products to visually impaired subscribers, who might utilize a screen reader software to read your emails. Aside from the advantages of accessibility for all your email list subscribers, using alt text will also serve as a reminder for some to whitelist your emails. Providing more information about your images might entice some subscribers to change their settings if they are interested in viewing the images in your emails. How can you use alt text in images with SmartrMail? SmartrMail makes it extremely easy to input alt text when including images in your email newsletter design. It takes seconds to help make your emails more accessible and effective for all of your subscribers. After choosing the segments you wish to send to, writing a subject line, and choosing the other design elements of your email (such as your store’s logo, colour, layout, etc. ), you can start adding images to complement the content in your newsletter. After uploading your image and adding a link, enter the alt text for your image. This should be a concise, but accurate description of the image you’ve included. You should provide enough details of the image for subscribers to get a good idea of its contents, but not any redundant or superfluous details.